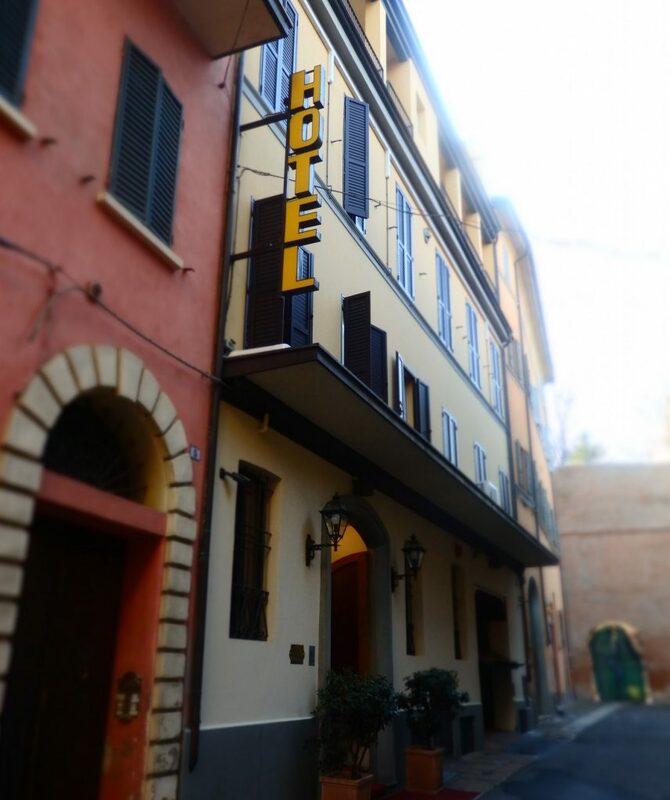 When I met Manuela Stagni at the World Travel Market in London and saw her enthusiasm in describing her hotel, the Hotel Touring in Bologna, Italy, I made a note to keep her in mind if I ever traveled in Italy again. A couple of months later, when she mailed me an offer to stay at her hotel, I jumped at the chance to explore Bologna for a weekend. The Hotel Touring is located on a narrow side street, which means it is remarkably quiet for a city location. The Hotel Touring, it turned out, made a sharp contrast to the last three-star hotel I stayed in: my review of that South Korea hotel was less than stellar. The main problem was that many things about that hotel hadn’t been well-thought-out, and I ended up writing a post called 11 Tips for Hotel Management. I concluded that good hotel management shouldn’t even be noticeable. The Hotel Touring lives up to that description. Hotel Touring is definitely at the four-star end of the three-star range. It’s family-run: everyone we met (except for one hotel school intern) seemed to be related in some way or other. With only 38 rooms, service is personal and thoughtful in a way that only family-run hotels can be. Our room – I stayed with a blogger friend, Shobha of Just Go Places – was not large, but plenty big enough for two, and scrupulously clean. It had all of the necessary furniture, a wall-mounted TV, a safe and a mini-bar. The décor was sophisticated and modern in shades of white and grey. It had clearly been quite recently renovated, and I was told that only the first floor has not been renovated yet. Some rooms are bigger, some have balconies with views, and four suites are available too. Our bathroom had a very welcome rain shower and stylish fixtures for the sink, bidet and toilet, as well as plenty of large high-quality towels. I was particularly impressed at the quality of their free wifi; facetiming wasn’t a problem, and there were plenty of accessible outlets around the room. Each room has air-conditioning and an in-room safe. 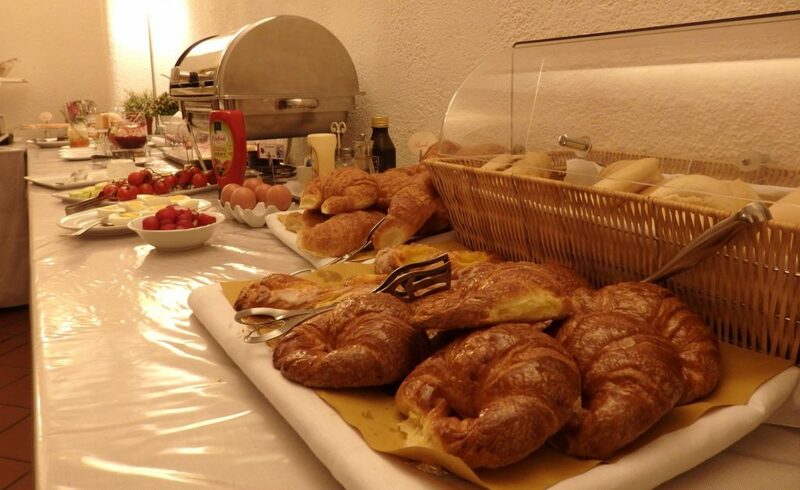 A good continental breakfast is included, offering a wide array of choices: bread, cheese, sliced meats, eggs, yogurt, pastries, fruit, juice, coffee, and so on. It is served in a cheerful basement room that was once a wine cellar. Hotel Touring’s top selling point, though, is its location. Right around the corner from San Domenico church, it’s only a few blocks to the most important sights like Piazza Maggiore and Torre Asinelli. And yet, because it’s not on a main shopping street, it’s surprisingly quiet despite its excellent location. This panorama includes about half the view from the Hotel Touring rooftop terrace. From the roof, the central location of the Hotel Touring becomes particularly clear. A lovely rooftop terrace reveals almost 360-degree views. We could see all of the major churches as we looked over the city’s red roofs. Even the distant San Luca church was visible. In the evening, the lowering sun gives everything a warm Mediterranean cast. We visited in winter, but I could see how pleasant that rooftop terrace would be in warmer weather. A Jacuzzi on the roof, available to guests in the warmer months, must be heaven with that view. 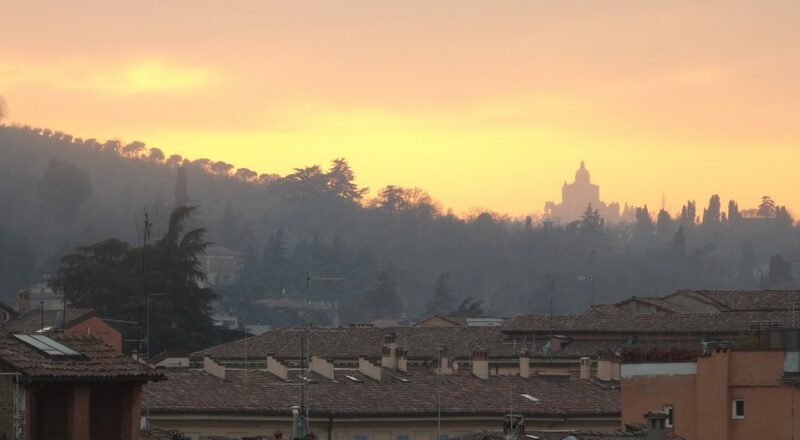 view from the Hotel Touring rooftop terrace at sunset, with the Church of San Luca in the distance. Bologna, meanwhile, is a dynamic small city of 375,000 inhabitants, and it’s well worth exploring. I’ll write more about it in later posts. In the meantime, read Shobha’s article: Five Reasons to Visit Bologna with Kids. If you decide to stay at Hotel Touring, you can get a 15% discount on their rates, which range from $80 – $325, by booking directly at hoteltouring@hoteltouring.it. Disclosure: While I received two free nights at Hotel Touring (we paid for a third night), all opinions expressed here are my own. I’d like to thank Manuela and her family for giving us such a pleasant weekend in Bologna! Thanks for inviting me! I had a great time and loved Hotel Touring. Finding a great 3 star hotel like this is like gold dust. I know! I had a great time! We enjoy staying at family run places and I love the location of Hotel Touring – close to the sights but in quiet local area. I definitely recommend it if you visit Bologna! 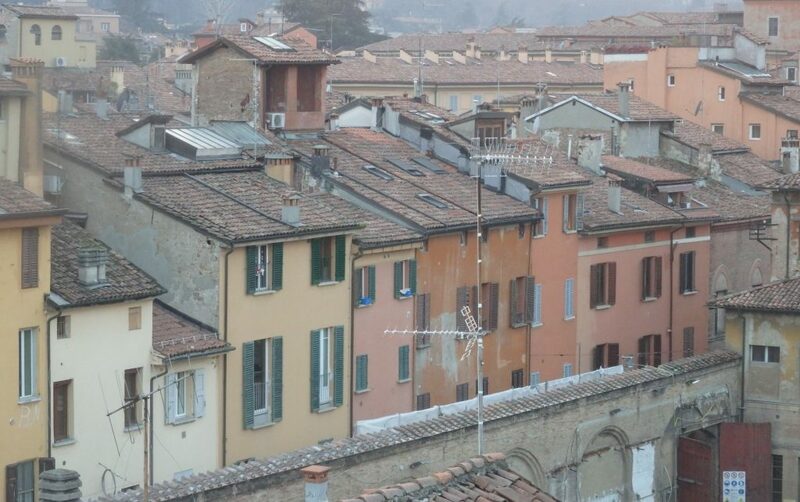 I just read one of Shobha’s stories about Bologna. Looks like a great city. Hopefully, you guys are going to write about the food in there. Great to know you guys had a pleasant hotel stay. When traveling, it feels good to know you have a nice place to rest after a day of walking all over a city. We did a whole day-long food tour, so, yes, we’ll write about the food! This sounds like my kind of place: I love smaller properties, personal service and discrete attention to detail and that rooftop jacuzzi doesn’t sound half bad either. I would have loved to use the jacuzzi even in the middle of winter, but I can see how that would not be very economical for them. Sounds like a great find. I’m all about the small hotels! Small anything! Small museums, small sights, small towns. Much more interesting and generally a lot less crowded than whatever’s big! It’s always nice hearing about good hotels that exceed their 3 star rating. I almost went to Bologna after doing Cinqueterre, but ended up in Genoa. I’ll have to see what else is in Bologna for my next trip to Italy. We’re considering seeing Cinqueterre over the summer, partly so that I can go back to Bologna. There was so much I wanted to see there and a weekend wasn’t enough time! I’d certainly recommend it! I’ll post more about Bologna in the next few weeks. That picture with the church of San Luca in the background looks idyllic! Also, I notice what seems to be a artwork of Rio above your bed? Maybe I’m mistaken. Good to get honest tips from bloggers on hotels – thanks for sharing yours. Yes, that’s Rio! I’m not sure what the link is, but in one other room I saw, there were tiles in the bathroom that referenced other cities. I guess it’s just a general “urban” theme. Love family run hotels and the Hotel Touring looks like a great value with many comforts and a soothing decor. 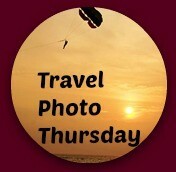 I’ve pinned this post to remind me of your recommendation for a future time when we can travel to Bologna. Thanks for the tip! You’re quite welcome! Don’t forget to ask for the discount!